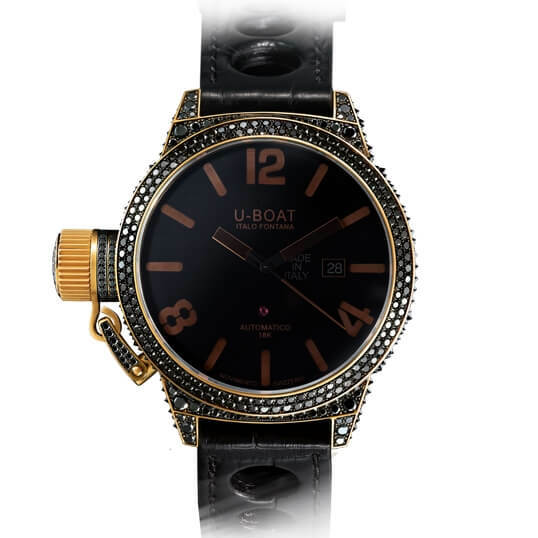 Automatic mechanical, personalized to U-Boat specifications. Solid 18 K gold, satin hand finish, 45 mm diameter, yellow gold (2N). Crown on left side, with a special protective device. 18 K gold cup crown. Gold total weight 108,25 gr. There are 800 white and black diamonds, 11 carats in total, patiently set one by one on the case and buckle. Reversed diamonds on the carrure. 18 K solid gold, sealed with 8 external screws. With visible ruby. The dial of this model is made up of two superimposed dials, one in 18 K gold and the other cut, and treated with high technology composite opaque black pigments, also used in the production of military devices. High quality sapphire, scratchproof, fumé. Hand made and hand finished alligator black leather, square scale, 18 K gold personalized U-Boat tongue buckle, with black diamonds set on the side of the buckle.